Worry, anxiety, and fear seem to predominate these days. All of us are under a seemingly mounting pile of work and responsibility, and an increasing drive for that greener grass in the distance (a better life, new relationship, emotional freedom, successful business, the list goes on). These conditions, in conjunction with our brain’s hard-wired slant towards fear-based thinking, make it difficult to get through the day without experiencing some form of fear. What do I mean by fear? When I talk about fear, I mean anything in the range of emotions and feelings associated with worry, anxiety, trepidation, and outright fear or terror. I’m referring to those things that you feel as a knot in your stomach, a weight on your shoulders, or the thoughts that keep you up at night. I am NOT referring to situations where you are physically at risk or in real mortal danger. What happens when we live in fear and worry? On a cellular level (and we are just macro expressions of what goes on inside of us on a micro level) there are just two states of being: growth or protection. When our environment signals safety, love, and nourishment, our autonomic nervous system (ANS) switches into rest and repair, the perfect state for growth and healing. We are also more creative, and more easily able to learn, to love, and to thrive. When our environment (and hello, this includes the space between your ears) signals worry, anxiety, or fear, our ANS switches into protection mode. Our fight or flight system is then engaged, we become vigilant and we are unable to heal our bodies, or rest well at night. Fear and worry are pervasive. Once we are in survival, we can easily get stuck there, by thinking the same old thoughts that are equal to the way we are feeling, which perpetuate more of the same old thoughts. It’s a stinkhole of suffering, yet we all have been stuck there. And I’m sure you can think of people who’ve made that stinkhole a home. Why is walking with fear so darn difficult sometimes? We are hard-wired to be averse to discomfort and pain, to turn away from it at first glance. It’s why we don’t make a habit of touching hot stoves. 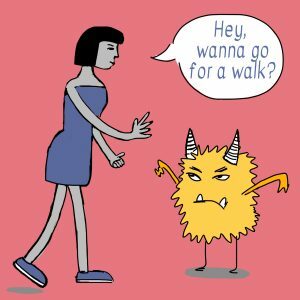 But when we pretend that our experience isn’t really happening, or we address only the symptoms through coping mechanisms like staying really busy, boozing it up, sleeping, or exercising too much, or taking meds as a first resort, we are really creating the SuperBug version of fear. Because, you see, what we resist will only persist. What does this mean, to walk with fear? No two ways around it, fear is simply a huge part of the human experience. But if we keep looking away, running away, or otherwise pretending it doesn’t exist, like a long shadow at dusk, it grows and grows. But the good news is that we humans have free will. We have the choice to either run and hide from it, or to look right at it and take a walk with it. How do we do it? How do we walk with fear? The first step is just to sit with it. It sounds simple, but this can take extraordinary courage. This means becoming aware of it and just letting it BE, without trying to change your fear, or the situation causing it. Can you look the beast in the eyes? Can you see it for what it is, and maybe get a glimpse of where it came from? Can you sense it? And by that I mean use all of your senses (visual, touch, smell, sound, taste, etc) to get a better understanding of it or the situation that is causing the fear? By using your senses, you tune in to the innate wisdom of your body to develop a new understanding of your situation. Awww, momma pwease don’t yell at me! With this new understanding, can you name it? Just this simple act of naming your fear will shift the balance of power in your favor. And with just these new bits of information, you can then lace up your shoes, get outside, and start walking.